Think of someone you are especially grateful for . . .
and then imagine yourself looking this person straight in the eye, expressing your gratitude and wishing health, happiness, and creativity. Then imagine that you are looking at yourself straight in the eye and wish the same thing. The other day I was at a small party and had just met this woman who, in the midst of conversation, said "Things are difficult for my family right now because my brother was severely injured in a motorcylce accident." Accident? Injury? I perked up - "What are his injuries?" I asked. "Well he's brain injured, among other things," she answered. "I have a brain injury!" (those five words don't scare and depress me as much as they used to). Bottom-line, TBI survivors should avoid situations that can be described by two or three of these words (one is usually okay for me). SLOWLY BUT SURELY, my memoir is nearing completion. I submitted it to a self-publishing company (my best option, I believe, is to self-publish this memoir rather than to keep submitting and resubmitting to a billion different publishing houses in hopes that one of them will like it). The last company I submitted to said, "You have excellent writing skills and a unique voice. . ." but they don't know how to effectively market my story. 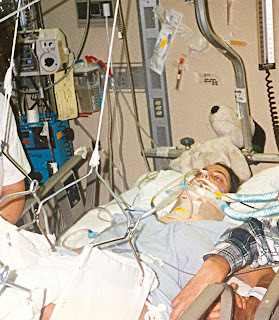 But as a Traumatic Brain Injury Survivor, I know what kind of memoir I'd like to read, I know what kind of survival story is helpful to me, so I'm just writing my own story like this and I will market it on my own. I received a PDF with my book cover and I thought it was super ugly. So I'm selecting a different style and I'll try again. This whole book publishing thing takes a long time . . . KEEP CHECKING MY WEBSITE OR BLOG FOR UPDATES. Physical Fatigue: Last Tuesday I went the gym and did a one hour Spin (Cycle) class and then went right into a one hour Yoga class. Sometimes on Monday I'll do a one hour weight lifting class and then a one hour Spin class immediately after. I feel tired EVERYTIME I do double fitness classes. In fact, I felt limp walking to my car after class and I COULDN'T WAIT TO GET HOME TO TAKE A NAP. Cognitive Fatigue: Yesterday I picked up this month's read for my bookclub. I read the first twenty pages last night before bed (when I was already tired which wasn't the best move for my reading retention). The book is called, Good Omens: The Nice and Accurate Prophecies of Agnes Nutter, Witch (supposedly an easy read, science-fiction, British Humor. And let it be known that I'm not much of a fan of British Humor, or should I say humour?) After completing the first ten pages, I realized that if someone had asked me to briefly summarize what I'd just read, I wouldn't even be able to tell them the name of one character, let alone the title of the book. So I decided to just start over. I read the first seven pages again and I just couldn't focus on what was happening in the story. There was a character named "Crawley" and weird things happened. That's all I could remember. "This book is stupid," I said and got ready for bed. I COULDN'T WAIT TO CRAWL UNDER MY COVERS AND FALL ASLEEP. After a workout, I experience physical fatigue. 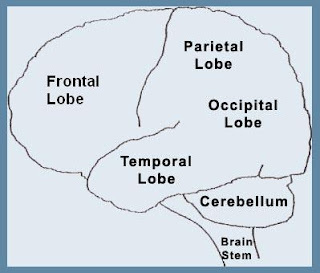 After reading a book, listening to a lecture, or usually after talking about my brain injury, I experience cognitive fatigue. It's much easier to recover from physical fatigue than from cognitive fatigue. First, avoid brain-taxing stuff in the evening. A lot of people read before bed to help them sleep. I can do this if I am not too tired and it's something that I've read before. But give me something unfamiliar and I get so cognitively taxed trying to remember each paragraph as I read, that it becomes difficult to fall asleep. Second, take brain breaks - one every couple hours, preferably in the dark and dead-silence. Sometimes at work, I'll take ten minutes from my lunch, go sit in my car wearing an eye mask and ear plugs. Third, eat healthy (limit pre-packaged meals, sodium like potato chips and sugar before bedtime. Fill up on vegetables and whole grains). Nourishing food for your body is similar to gasoline for a car - - a car needs fuel to even operate and your body needs healthy food to operate efficiently. Fourth, exercise. Maybe I should have put exercise as number one on my list since I find it the most effective, but I put it fourth in that I was saving the best for last! I've always been a "go-to-the-gym" person (thank my dad for this since I attribute this trait to his OCD gym attendance when I was in high school), but after my injury, exercise at the gym helped me to feel "normal" again. Here is why: (A) the gym was a familiar place since I always went there pre-accident and Survivors prefer the familiar. (B) class helps me to focus because I have to follow the instructor. (C) the instructor has already pre-planned my workout so I don't have to. (D) I love seeing my friends in the class as I am motivated by other people (that one is just personal preference and has nothing to do with my injury). EXERCISE SPECIFICS: I TRY TO DO ONE OR TWO SPIN CLASSES PER WEEK, TWO WEIGHT BEARING CLASSES PER WEEK AND TWO YOGA CLASSES PER WEEK. LET IT BE KNOWN THAT YOGA IS THE BEST FOR TBI BECAUSE IN ADDITION TO ELONGATING AND STRENGTHENING YOUR MUSCLES, IT CHALLENGES YOUR BALANCE! This website has a section for People with TBI, for family and friends of Survivors, and for professionals. It has videos and lots more. It's a great resource! A few months ago I attended a Memoir Writing Workshop at the University of Iowa, to help me find direction and focus for my book (I posted about this earlier on too). The workshop was FABULOUS (bolded, italic and red for extra emphasis). It gave me more direction in my writing than I'd ever hoped (let me just rave some more about the U of Iowa and what great writers come out of there). Anyway, our instructor had us do several short-writing activities. The one that helped me the most was the time he asked us to describe what we hope our readers will get from our memoirs, but using only ONE WORD! It didn't take me more than a few seconds to think of my word and as soon as I articulated that ONE WORD, my goal as a memoir writer became clear. I feel like so much about Traumatic Brain Injury is not understood. For several years after my injury, even "I" did not understand my injury. Most TBI Survivors (including me) have the following "troubles:" (this is my own simplified list accompanied by my own plain and simple descriptions, but I'll add a final note from something Dr. White, who wrote a Foreword for my book, told me that helped me understand WHY we are like this). Balance and coordination problems (walking downstairs takes an excessive amount of concentration so we won't fall, plus I have double vision which confuses my brain whenever I look down). Short-term memory loss (by lunchtime I rarely remember what I've eaten for breakfast and I hate, hate, hate when people ask me, "How was last night?" because I never have any idea what I did last night. A better question is,"How was Jared's wedding reception last night?" -which is what I did tonight, so hopefully tomorrow someone will be specific if they ask me about what I did last night). Sleep disorder (I can't remember the last time I slept more than 7 hours straight, regardless of how tired I am. More often than not, I sleep 5 hours straight, wake up dead-tired, and then force myself to fall back asleep which takes 2 hours, and then I sleep for 2 hours. Which is why I try my hardest to get 10 hours of bedtime. This torture sleep cycle is beginning to change for me, however, since I've tried to go to bed at the same time every night which sets my body clock and I stopped eating sugar and salt late in the afternoon or evening, exception tonight since I had cake and sweets at the wedding, which would explain why it's 11:30 pm and I am still awake. Guaranteed, I will struggle tomorrow with focus and motivation and horrible exhaustion. But I'll go workout at the gym and take a nap afterwards.) Sorry for all the run-on sentences! Brain Overload (too many people, too much noise, or unfamiliar surroundings make me feel, literally, like a metal bar is shot through my head. My brain HUUURRRRTTTS and the only thing that makes it not hurt is absolute silence in a dark room - -I sleep with ear plugs and an eye mask). So back to my U of Iowa story and the fact that my one-word is "understanding", I just hope that anyone that reads my memoir will finish it with a greater understanding of the ramifications of Traumatic Brain Injury and cut us some slack. And I hope other Survivors who read it will be able to cut themselves some slack and know that they aren't alone. DR. WHITE, in the Foreword he wrote for my book, explains WHY. He says, "She struggles daily with fatigue, memory loss, and attention because the injury disrupted her brain’s circuitry, has undergone a re-routing and simply isn’t as efficient anymore." Several weeks ago, someone posted an anonymous comment on my blog asking, "Now how about your thoughts on FEAR?" (Although they posted as "anonymous," I can guess who this person is, considering that they referred to being at the Brain Injury Conference. I think it's the same person who asked me why I'm not blogging as often, but I could be wrong). So here are my thoughts on FEAR (in relation to TBI, not in relation to seeing a scary movie or riding a fast roller-coaster). For the first 8 years after my injury, fear consumed me. My active personality lends itself to the idea that we are all in control of our own destiny. I liked to accomplish, get things done, follow-up, be in charge, problem solve, mult-task and make things happen. This wasn't something I really worked at, these traits came naturally to me and I enjoyed this stuff. After my injury, I still wanted to be this person, I still tried to act like this person, but I wasn't any good at being this person. Suddenly, I was no longer in control of my destiny. I was lethargic and constantly cognitively exhausted, plus I always forgot what I was supposed to do and how I was supposed to do it. If someone asked me to do something, I was fearful that I'd fail, or worse, that I wouldn't be able to accomplish at the same level as before. That statement makes it sound like I'm referring to something difficult like the time I spent a week alone in Paris (after TBI), which I kind of am but my fear really refers to that time when I fell running to the bus one morning because I forgot to tie my shoes, or that time back in college when I went to a dance club with my friends and couldn't do anything but sit in the corner because the noise and too many people made me feel like a metal bar was shot through my head (you may be reading this thinking, "I hate dance clubs too" but any TBI survivor reading this will agree that it's not the same feeling). Bottom-line, after my brain injury, my strengths became my weaknesses. Suddenly finishing a task became a great feat, problem-solving and multi-tasking took an excessive amount of brain power. I feared failure in everything because I wasn't good at any of the things that I used to be good at. This kind of fear doesn't consume me any longer (which is why I used the past tense this entire time). I'm more frustrated by my injury than fearful of it. I've reached a new level of acceptance in my recovery. Up until about five years ago (the time I moved from MN to UT), I wasted a lot of energy ignoring my deficits and trying to push past my injury. I tried to be that same woman who loved to multi-task, problem-solve and take charge. In retrospect, I cringe at the silly things I said and did after my injury/post hospital because I was so brain-tired, overloaded and out of my mind half the time. I tried to be the same person in MN because I was with the same people, doing the same things as before my injury. When I moved to UT, I embraced my new self. I started fresh and reinvented me because everything was new. I feel like I'm sort of babbling but I guess what I really mean to say is that I'm now comfortable in my TBI skin because yes some of my previous strengths have become weaknesses but I just have to work a little harder (okay let's be honest, work A LOT harder) to make them strengths again. I also see that I've developed new strengths after my injury. My new self is softer, more willing to help and far more understanding of another person's struggles. I no longer feel the complete need to control my destiny because I now see that sometimes things just happen and we can only do the best we can to accept the consequences if they are beyond our control. (AGAIN, I'D LOVE TO HEAR YOUR REACTION IN A COMMENT TO THIS POST IF YOU READ IT). But . . . I just VOTED! They offered early voting this year in Utah (I thought it was everywhere but my mom said that in MN you have to apply for early voting only if you're going to be out of town or something). Anyway, I am not going to say who I voted for or for which party but I will say that I voted some Republican and some Democrat. AND I will also say that I'm proud to live in a country where we have the freedom to participate in our government. AND I will also say that I'm relieved that I can take advantage of this freedom (I guess that's my TBI connection) considering that the doctor told my parents that I probably wouldn't make it through the night (14 years ago, the day after my accident), clearly he was also telling her that I would never cast another vote for leadership in this country. . . ! See me do Yoga (the cure-all) on TV! I'll be on KJZZ again! 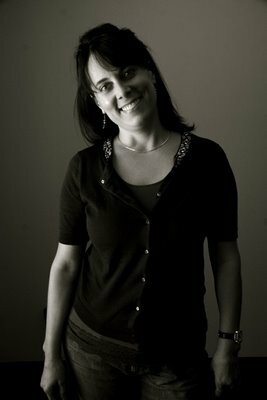 Denise Druce just invited me to appear on her show tomorrow morning (Tues) to help demonstrate some Yoga poses. I'm really excited as she said the other guests on tomorrow's show are all people who have overcome a huge trial, hopefully using fitness. So I'll fit right in! Friends keep asking me "how's your book?" 1. If I was a famous person, my book would easily be published because it's a great story. But I'm just a random, average person. 2. People are unfamiliar with brain injury and assume it's an . . . an . . . I forgot the word I was going to use, seriously it was just in my head and I thought about something else for a second and the word dissolved. This is the brain injury battle - words dissolve in your head. Anyway, I can't think of the word but it's the same thing as an "uncommon" or "rare." Bottom-line, I understand why a publisher doesn't think they can market this book and with the way our economy is, they want to publish potential best-sellers. SO I'VE DECIDED TO SELF-PUBLISH!!!! So I'll definitely post an update when the book is published (I've already found a self-publishing company and had them print one test copy. . .) and let you know how you can buy it! Life is NOT like a box of chocolates. 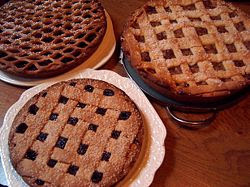 . .
Life is like a slice of pie . . . The following are my thoughts from the Stephen Sheppard, PHD keynote address at the Brain Injury Association annual conference (today). Although many people are in constant struggle to balance their "slice of pie" elements, it's very difficult for a Traumatic Brain Injury Survivor because we have so much collateral damage (ability to sleep, short-term memory, difficulty paying attention, coordination, loneliness, job loss, emotional outbursts). For years after my injury, I tried to slice my pie the same way as I always did. I was tired, but I didn't take naps (who has time for naps?). I wanted to go to graduate school, so I did -without taking into account that I didn't have a decent short-term memory (asking a TBI Survivor memory taxing questions makes our mind and body feel as if we've just run a full marathon). As a result, my life was extremely unbalanced. Nine years post-injury (I just passed my 14 year mark in August) I finally started slicing my pie differently and I am SOOOO much happier! I'm more Productive because I know my limitations and I say NO to things that I know will be too much (i.e tonight I was supposed to go to my friend's birthday party but I decided to skip it because talking about brain injury anything for an extended period of time wears me out and 2day I was at the TBI conference all day. I also have to work tomorrow and catch a flight immediately afterwards because I'm going to CA to visit my brother. I knew I'd be too tired to do anything after the conference). There was a time not so long ago where I would have just forced myself to do it all: the conference, the party, work, etc with no stops. NOW I'm SOOOO much more realistic about my limitations. My Spirituality is in check because I take TIME to relax and to meditate (same thing that helps me be more productive). My Recreation is still limited but I've learned to "work with what I got." As I said before, I know my limitations - I know what's going to tire me out and how much recovery time I'll need after an activity. Example: hiking is very difficult, especially late at night and especially over uneven terrain due to my balance and coordination problems. But I realize that this is worse in the evening so I found a hiking group which meets in the morning! Bottom-line, I can still recreate with a few adjustments. ANY UT TBI SURVIVOR SHOULD JOIN THE NATIONAL ABILITY CENTER FOR HELP WITH RECREATION (that's my NAC plug). The same thing goes for my Social Life -too taxing, too tired, too late and I just can't participate. Okay let's be honest, sometimes I DO participate in social events that are too much and I end up regretting it but you live in learn (I'm talking about attending social events with lots of people, late at night when I've already had a long day. If it's not a work day and I get a good nights sleep the night before, then I'm usually okay). This post is much longer than anything I've ever written before and I'm not sure how many people read my blog anyway - yeah my counter says 1880+ people viewed it but that might just mean "looking" and not "reading." So just out of curiousity, if you actually READ this post, please let me know by adding a comment below. . . This coming Thursday and Friday is THE BRAIN INJURY ASSOCIATION OF UTAH FAMILY AND PROFESSIONALS CONFERENCE in Layton, UT. I'm really excited because this conference is so enlightening and revealing: with hundreds of people in attendance (TBI Survivors, family members, medical community), I realize that I'm not alone in my struggle. 5.3 million Americans have disabilities resulting from Traumatic Brain Injury and only a couple hundred will be at this conference. Wade Justice, M.D. is the keynote speaker. He sustained a severe Traumatic Brain Injury three and a half years ago after his vehicle was hit by a drunk driver. He'll share his personal struggle with Brain Injury as well as where he is after "re-inventing" himself. I cannot wait to hear his process -especially since I've spent the last fourteen years re-inventing my own self - and I hope to learn some valuable tips for living with TBI. Tonight I bouldered at Rockreation! So several months ago I practiced indoor rock climbing THREE times with the National Ability Center - I learned about the harness, the gear, and Kim Millikan at the NAC was my belay. 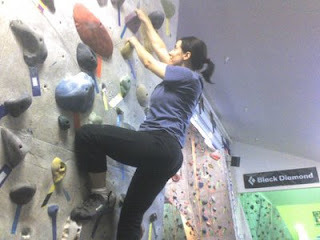 It was difficult but invigorating to be on the wall. Tonight I tried it again with Denise Druce at Rockreation in SLC. 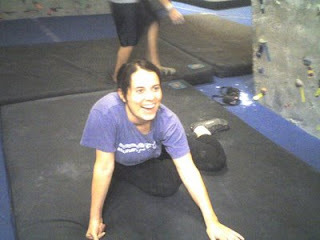 This time I bouldered - no ropes, just my strength. Denise suggested I put this photo up - - to compare with the photos of me in the hospital, also on this blog. Where did I get my blog and book title? Once my niece pointed to the scar at left (can you see it?) and said, "You have a smile on your forehead." View me on Daily Documentary! The photographs are nice - but admitedly I cringed after hearing the sound of my voice on the Podcast . . . EXERCISE Rule #1: Exercise boosts brain power. SURVIVAL Rule #2: The human brain evolved, too. WIRING Rule #3: Every brain is wired differently. ATTENTION Rule #4: We don't pay attention to boring things. SHORT-TERM MEMORY Rule #5: Repeat to remember. LONG-TERM MEMORY Rule #6: Remember to repeat. SLEEP Rule #7: Sleep well, think well. STRESS Rule #8: Stressed brains don't learn the same way. SENSORY INTEGRATION Rule #9: Stimulate more of the senses. VISION Rule #10: Vision trumps all other senses. GENDER Rule #11: Male and female brains are different. EXPLORATION Rule #12: We are powerful and natural explorers.